As good as 8-Bit OutRun, a worthy Arcade Racer for NES - with real cars too! Other Info: Three of the main figures at SquareSoft at the time (Hironobu Sakaguchi, Nobuo Uematsu and Nasir Gebelli) were largely responsible for the creation of this game. 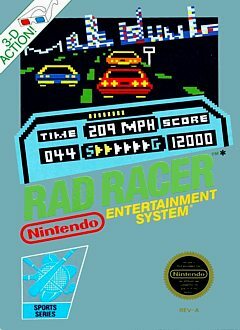 Rad Racer is often stated as an Out Run/OutRun clone. It is also stated by some however that it is more than a clone, but that it stands on its own and is credited for effectively conveying the proper sense of speed. 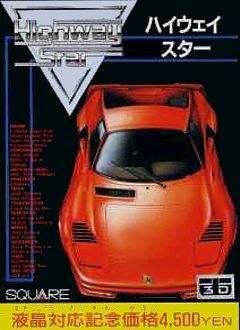 It should be noted that the two cars in the game (the 328 Twin Turbo Ferrari and F1 Machine) have no distinctions other than cosmetic appeal and "share" the same ending. Rad Racer has no credits. One of the tunes from Rad Racer was modified and used as a theme song for Stinkoman, an anime-parody version of the character Strong Bad from "Strong Bad Email". Strong Bad Email and Homestar Runner (which is what the cartoons are nominally centered around) have become huge hits. Welcome to my first review for a video game. 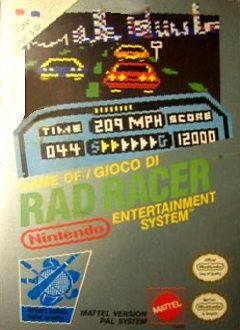 I chose Rad Racer because it is a worthy racing game on the NES - probably one of the best in specific categories! Also, it is one of my favorite play-me-for-five-minutes-to-get-a-quick-rush type of games! Well, let me begin with the review. The graphics in this game are very simple and plain. Most cars do not have much detail, and the scenery is rather plain. But, on the other hand, it is nice to note that each stage has a car that is real and unique [to that stage]. For example, there is a Beetle on the first stage, then you challenge a Corvette on the second stage. Other cars include a Lamborghini, a Ferrari, and a few more. Most importantly, Square did incorporate parallax scrolling in the background scenery. For example, you can see the background separate in half and move left to right to accommodate the viewing position from your car. This is quite a nice graphical technique that was implemented, especially since this game came out in the first generation of the NES. Gameplay is where this game shines. You are given a choice to drive one of two cars. You can take a Ferrari or a F1 race car. Both cars run at the same speed and have no difference in actual game play. They just look different. This game may remind some gamers of Pole Position since the car handles like the one in that game - only faster, and a little tighter with a faster response. The brakes in this game are spot on, akin to a real-life Porsche. There are two modes of acceleration. You can speed up by simply holding the A button, or you can hold UP on the controller as well as the A button. The latter is a pseudo-turbo-boost which allows to you speed up very quickly. The BEST stage to use this boost is on the third level - Grand Canyon. There is a LONG straight-away that lets you travel ultra fast and really makes you feel like you are speeding fast! This game has good music that is fit for racing. There are three tunes in all. One or two may start off slow but they pickup the pace into the middle of the song and make you feel like you are really advancing in the race. The sound effects are also fit for this game. They are simple and mundane, but effective. For example, you really do feel that you hit another car on the side when you hear the sound effect of *DAAHSH,* or that time when you will crash and send your car flying into the air *TAAKH TAAKH TAKKH! * I always wanted the soundtrack for this game but could not find it. The story is about you driving, and well, it gets interesting as you finish the game, and I would rather not ruin it for you. The ending is better than most racing games I have seen on the NES, and that's probably saying something. Now here it is...The thing you that you care about...Is this game FUN? In my opinion, yes, it is a LOT of fun. It is meant to be an *Arcade Racer*. If you can take this game in that context, you should not have any gripes. The game engine is basic and offers no simulation or upgrade ability, and you do not want that anyway: you want fast, fun, and the ability to finish-in-a-few-minutes because you want to play an Arcade Racing game. The music suits the arcade style very well (it is fast and keeps you on your feet �Eor should I say, thumbs...) which is very nice for the NES and the graphics offer a clean environment - play this game to drive for fun for a few minutes, or to get a quick rush of speed for those few minutes you have left for gaming. This game is the equivalent of Sega's OutRun on the NES. It offers what an 8-Bit arcade racer can offer at its best and provides a great racing video game experience. Borrow it from a friend or pick it up for a few bucks and give it a try. If you can't do either, then you probably know what to do next. It is one of the most fun arcade racers on the NES. I recommend it to fans of driving games and NES gamers abroad. I don't have much to say here. I loved Rad Racer when I was growing up. The game moves at fast and furious speeds, had three great tunes that you could switch between during your race at your earliest convenience (you can also turn music off), and it generally felt like an NES Outrun. Race to beat the clock and watch out for other cars on the road...even a small crash can have big consequences. I will say this; I wasn't nearly as satisfied with RR's "sequel", Rad Racer II, but that is for another time. The game is simple, but for its time, it was a lot of fun. Try finding some 3D glasses which came with the game at one point...if you're lucky, you might get the 3D mode working, though it also depends on your T.V. and various other things to get the 3D mode working properly. Even if you do, it's nothing great, but a neat novelty feature nonetheless. This game is very cheap and very common, so you should have little problem tracking a copy down. On the note of the soundtrack, we've uploaded MP3 versions of the classic tunes, so if you want them, come get some! This review has 27 extra images.